Objective, no fluff, keep it real reviews of hotels in Europe with photos and videos to help you decide on where you want to stay during your European travels. I stayed at the Kyle Hotel in Kyle of Lochalsh in the Scottish Highland in October 2017. It’s hard to find a cheap hotel in Kyle of Lochalsh, as it’s a small town and its proximity to the island of Skye makes it popular. The cheapest single room which I could find was £50 a night, including breakfast, booked through Superbreak. The Kyle hotel is located a couple of minutes walk from the railway station. My single room was a reasonable size. I had a sea view from my bathroom. The room was lovely and warm, which was welcoming, as it was dreich, wet afternoon. There wasn’t a proper chair in the room, just a stool at the desk. It wasn’t ideal for me working on my computer, The free WiFi was very good. It said on the hotel description that free WiFi was available in the public areas, I think that my room was above the public areas. The main issue that I had was the very creaky floorboards in the corridor outside my room and in the room above. I was awakened by other guests moving around. The bathroom was a spacious with a good sized bath. I really enjoyed a soak in the bath after my three hour delay on the journey from Stirling to Kyle of Lochalsh. The bathroom looked as though it had been recently refurbished. There was a buffet selection of cereals, tinned fruit (they don’t seem to serve fresh fruit in many Scottish hotels), fruit juice, yoghurt and some very tasty croissants. A hot breakfast was cooked to order. I thought that giving me one rasher of bacon and one fried egg was a bit stingy. In keeping with local tradition, the tomato was tinned. Check out time was 11.00. As my train didn’t depart until just after 12.00. I requested a later check out time of 11.45, which was granted. I wouldn’t rave about the Kyle Hotel. The room, although it was rather dated, was comfortable and cosy. with good WiFi, You have to expect creaky floorboards in an old building. Click here to check availability and price at the Kyle Hotel in Kyle of Lochalsh. This entry was posted in Accommodation, Hotel Reviews, Scotland on May 7, 2018 by Karen Bryan. I stayed at the Britannia Edinburgh Hotel on a Thursday night in November 2017. It cost £40 for the night on a room only basis, booked on the Amoma website. I really like the location of the Britannia Edinburgh Hotel on the banks of the Water of Leith. It takes around 20 – 25 minutes to walk to Princes Street from the hotel. It’s a five minute walk to the Scottish Gallery of Modern Art from the hotel. There’s a car park for guests, which costs £5 for up to 24 hours. You need to enter you car registration number when you buy your parking ticket at the machine. Then take the ticket to be stamped at reception as proof that you are a guest. This must be to discourage commuters and shoppers from parking at the hotel, as £5 for 24 hours is very cheap for parking in the area. I arrived at the Britannia Edinburgh Hotel around 12.30. Check in time wasn’t until 3pm, but I wanted to park my car at the hotel and walk up to the Odeon Cinema in Lothian Road. The very cheerful and friendly reception allowed me to check in early. I had requested a room with a view of the Water of Leith which was granted. The hotel was formerly a Travelodge, so a lot of the room fittings and the shower room were very familiar. There was an addition of a table lamp on the desk, an armchair, an iron and ironing board and a glass bedside table. I didn’t try to WiFi at the Britannia Edinburgh Hotel as I was out for most of the evening and I had a good signal with my Three mobile broadband. I found the bed to be very comfortable. There was only a small electric panel heater in the room, but I don’t like the bedroom to be too hot, or a I can’t sleep at night. I enjoyed my stay at the Britannia Edinburgh Hotel. At £40 for the night, It was good value for money for the location. It was great to be able to park for only £5 and my room was quiet and comfortable. 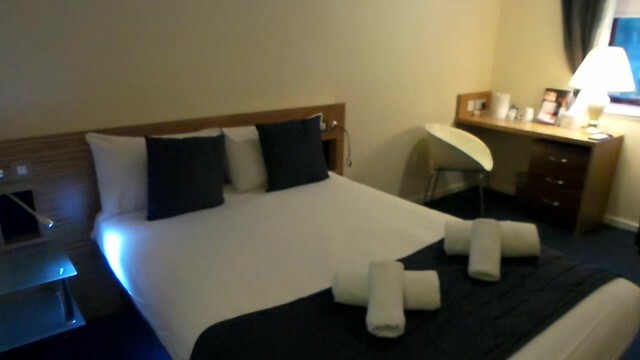 Click here to check availability and price at the Britannia Edinburgh Hotel. This entry was posted in Accommodation, Hotel Reviews, Scotland and tagged Edinburgh on April 26, 2018 by Karen Bryan. i stayed at the Peebles Hydro Hotel in the Scottish Borders on a Wednesday night in November 2017. I paid £36 for a single room, including breakfast, on the Amoma hotel booking website. I arrived at the hotel around 3pm, just as it was starting to rain. I couldn’t find a space to park the car at the front of the hotel, but there were spaces in the small car park a little way down the hill. There was a beautiful fountain opposite the entrance to the hotel. As is the staircase up to the reception desk. The receptionist who checked me in was very friendly. I was happy with my single room, as it was a good size. It was located at the rear of the hotel. The window looked out on some trees. The room was quite low key with muted colours apart from the curtains. I found the bed to be very comfortable. The WiFi was very good. The bathroom was also spacious. The bath was large. The breakfast was much better than in many other Scottish hotels in which I have stayed recently. The fresh fruit salad and fruity yoghurt were tasty. The restaurant was rather grand with several chandaliers. As it was dry that morning, I had a walk around the grounds of Peebles Hydro. There was an archery area, tennis courts and outdoor chess/draughts. Overall, I enjoyed my stay at the Peebles Hydro Hotel. At £36 for bed and breakfast, it was good value for money. The location is beautiful. My single room was much larger than the single rooms in most hotels. The breakfast was good quality and all the staff were focused customer service. Click here to check availability and price at the Peebles Hydro Hotel. This entry was posted in Accommodation, Hotel Reviews, Scotland on January 18, 2018 by Karen Bryan.